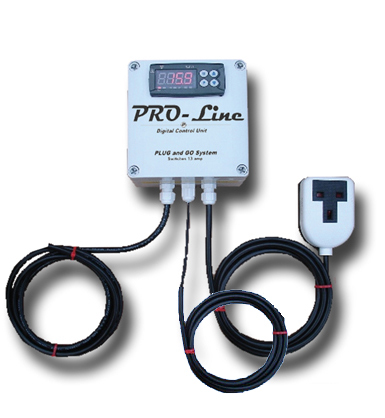 Pro line Titanium Aquatic Pond Heater with Pro Line Digital Stat, these are ideal for quarantine systems or smaller ponds, comes complete with Pro-line digital thermostat. These all new Pro line heater units have titanium heating elements with pure Titanium flow tube and elements ensure its suitability for use on All Aquatic Systems, including salt water / tropical marine. The decision to produce a Titanium heater was made for a number of reasons. With outstanding resistance to fatigue and erosion, Titanium has a low density, excellent strength and has super corrosion resistance. It is considered to be physiologically inert. Therefore, this new Pro line Titanium Aquatic Pond Heater is also suitable for heating acids and virtually any other liquid. Accurate to + or - 0.5 deg C the special thermostats have an internal relay that allows them to be used on a wide range of applications including gas and oil boilers as well as electric heaters. These units represent very good value for money indeed. To calculate the correct heater size you will need 1kw per 1000 gallons. All the units in this range can be connected to a normal domestic 13 amp mains supply. These new Pro-line heaters also offer ultimate flexibility in that the heaters and thermostats can be used independently. Should either unit fail, they can therefore be replaced individually and systems can be upgraded from 1kw to 2kw to 3kw using the same thermostat.